Choosing a coffin is an important part of the burial tradition. What people may not realise before going through this process is that there are a wide variety of options and considerations. This guide provides important information and things to consider when selecting and purchasing a coffin, from materials to cost and personalisation options. Whatever kind of coffin you choose, these tips will help you make the right decision for your needs. Don’t feel limited to what’s on offer in your local funeral home. Funeral Directors are legally obliged to accept coffins provided by yourself or a third party. Always shop around for appropriate styles and best prices. Traditional coffins usually come in standard, child, and oversize options. Standard sizes typically range from 5’0 to 6’8 long and often have a width of 24” or more. If you need a coffin size that differs from the standard measurements most coffin suppliers will offer custom made sizing depending on model and material. As a general rule a coffin should be 3-4 inches larger than the person the coffin is for. For example if the person you are buying for is 5’0 we’d recommend a coffin of at least 5’4. It’s worth noting that peoples measurements often change after death, meaning it’s best not to guess an appropriate coffin size and instead have the person measured before making a purchase. Coffins can be made to accommodate almost any size or weight, but this may impact your material and design options. Standard wood, wicker or metal caskets can normally hold weights up to 23 stones, or around 149kg, and oversized options can hold up to 360kg. Coffins typically come with 6 handles (3 on each size) and are designed to be transported by 6 strong adults. Some coffins handles are for display purposes only and not designed to be carried, if your ceremony is going to include carrying the coffin, it is important to select a coffin with load-bearing handles . As more people chose to represent their lives in their death, funeral personalisation has gained an increasingly important role. With enough planning, you can personalise almost any type of coffin, but for most, cardboard coffins provide the easiest solution. Cardboard coffins can be written or drawn on, have images printed on them, or easily have items attached. The demand for more funeral personalisation options has lead to a new wave of ‘picture’ coffins that allow for almost any image to be printed directly on the surface of a coffin. This technology has opened up new and creative ways for people to pay their respects or be remembered. Liners are a textile that sits inside coffins and improves the look and fit. Liners are usually made of fabrics like cotton or calico. Depending on your retailer you may be able to select the material, colour, and look of a coffin liner. If sustainability is important to you, biodegradable options made of natural materials are be available from most suppliers. 8. Do you really need a coffin at all, would a shroud suffice? All of which offer great personalisation options and environmental sustainability. Traditional British coffins are hexagonal or octagonal shaped, tapering from the shoulders to the feet. They have a solid, one piece lid and are most often made from wood or metal. This choice provides a classic look that honours tradition, while offering some options for personalisation. Picture coffins provide the opportunity to create or select a unique design that reflects the life and personality of a person. Personalised options range from large printed images often wrapping the entire coffin, to adding written messages and keepsakes to the exterior. Most picture coffins are made of cardboard although wooden options are now available. American-style caskets are rectangular in shape and are typically more ornate and expensive than other options. American caskets often have a hinged, split lid that allows for viewing of the body inside the casket. Available in a range of builds from mahogany to brass, American caskets are often priced to reflect the added cost of using expensive materials. Learn of the pro’s and cons of purchasing an ‘Eco’ or ‘Natural’ coffin. Cardboard coffins have a growing range of shapes and designs. They provide an affordable, simple option that is quickly growing in popularity. Why choose a cardboard coffin? When not to choose a cardboard coffin? Willow coffins come in a wide variety of shapes and looks. Willow provides a great balance between value and high-end natural design. Why choose a willow coffin? When not to choose a willow coffin? Often described as more 'approachable', pure new wool coffins have no hard edges and are often supported by a recycled cardboard frame. Wool coffins are relatively new, sustainable, funeral option that will only grow in popularity. Why choose a wool coffin? When not to choose a wool coffin? Bamboo has strength-to-weight ratio outperforming steel while, bamboo groves produce 30% more oxygen than trees. As such bamboo is an increasingly popular choice for coffins as an environmentally friendly material. Why choose bamboo a coffin? Why not to choose a bamboo coffin? Seagrass is a natural freshwater plant which is grown in abundance in wider Asia. 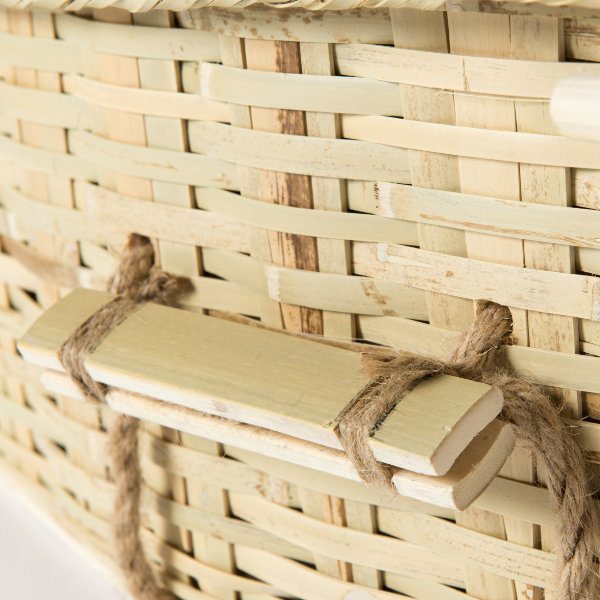 Seagrass is normally sun-dried, spun and woven onto a bamboo frame to form a unique, sustainable, oval shaped coffin. Why choose a seagrass coffin? Why not to choose a seagrass coffin? The seagrass is sometimes harvested from fragile marine environments. Check with you coffin supplier. Traditionally, coffin burial shrouds are made of white cotton, wool or linen and offer unmatched affordability while also being bio-degradable. Why choose a coffin shroud? Why not to choose a coffin shroud? Wooden coffins are still the most popular choice for consumers in the UK. Pine is a sustainable choice for a solid wood coffin, suitable for burial or cremation. Why choose a pine coffin? When not to a choose pine coffin? Price range: £500 - £700. Banana leaves can be twisted and woven into beautiful, soft coffins that are environmentally friendly and natural. Banana leaves are flexible, waterproof, and often a renewable resource. Why choose a banana leaf coffin? Why not to choose a banana leaf coffin? Often shipped to the UK creating a carbon footprint that may damage the environmental gains of the material. Price range: £450 - £700. Pandanus is used as a building material across Asia . Strong, rustic and often sustainable Pandanus offers a unique alternative to a Willow coffin. Why choose a pandanus coffin? Why not to choose a pandanus coffin? Price range: £400 - £700. Learn the pro’s and con’s of purchasing a traditional coffin. Traditional coffins come in a wide range of materials, one of the most common options being chipboard veneered coffin and caskets, sometimes also known as ‘wood effect’ coffins. Veneered coffins offer affordability and good strength however, the veneered material covering the coffin (added to give a natural look) is often attached via glues containing formaldehyde, a toxic chemical considered harmful to the environment. Why choose a traditional coffin? When not to choose a traditional coffin? Price range: £350 - £1500. Learn of the pro’s and cons of purchasing an ‘American Caskets’ type coffin. Half-view caskets have a lid that consists of two separate, hinged pieces. This allows for the portion of the lid where a persons head lies, to be open for viewing. 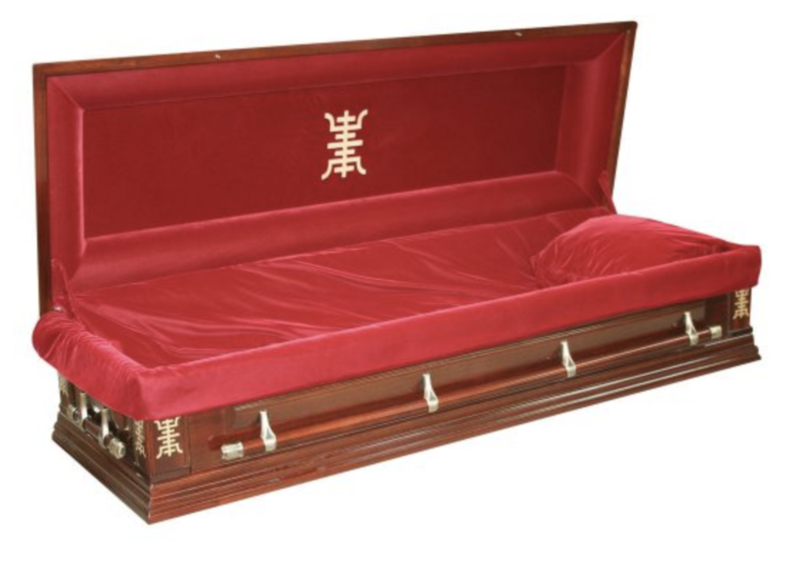 This type of casket is very common in the United States, and its popularity in the UK is growing. Caskets are normally made from hard woods such as mahogany or cherry wood but metals such as brass, steel and bronze are also available. These materials are less environmentally friendly and if not manufactured in the UK, Half-view caskets may also carry a large carbon footprint if shipped from outside of the UK. Why choose a half-view casket? When not to choose a half-view casket? Price range: £500 - £24,000. Full-view caskets have a lid that consists of a hinged piece that allows for the lid to be opened and the deceased to be viewed during visitation or other rituals. Most American style full-view caskets are not considered environmentally friendly due to construction materials and source of shipping. Why choose a full-view casket? When environmental sustainability is a concern. The best choice of coffin should reflect personal taste, the style of the occasion, practicality and affordability. Whatever your budget, remember there is no need to overpay for a coffin. Coffin options range from the affordable to the extravagant, and prices can vary significantly based on where you make your purchase. It’s always best to shop around, the internet has given funeral organisers more flexibility and choice so don’t feel limited by the range offered at your local funeral home. Could this article be better? Have we missed any coffin types you’d like to learn about? Feel free to leave a comment below or email us at support@thinkwillow.com and share your questions. *We have no affiliation with comparethecoffin.com, caringcoffins.com, naturalendings.co.uk or earthtoheaven.co.uk.